This is a story shared with me by my mentor and teacher, Jane Pettigrew. Like many great teas, this comes with a wonderful tale on its creation. There’re a few strains of the same lore, but all involved the unwitting foot soldiers of the Ming Dynasty. The truth is probably mingled between the fog of history and the steam of an aromatic brew. Lapsang Souchong is China’s first ever black tea, originally made in Tongmu Village, high up in the misty Wuyi Mountains of Fujian province, famed for their production of the earthy black tea. Time and tide may have passed, but the village remains as it was, still making Lapsang Souchong. But 1000 years ago before the Ming Dynasty, China used to only produce green tea that was compressed into cakes for easy storage. Legend has it that when the Ming Dynasty took control, the emperor forbade chinese teas to be compressed and insisted that the tea was made loose. 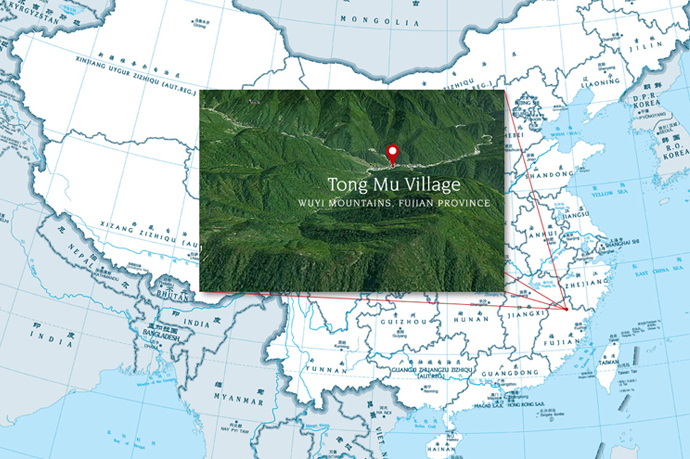 The Wuyi mountain producers were ‘lost’ and producing gardens shut down for around 150 years. When they eventually came to start again, they had forgotten the processes, methods and recipes developed by their ancestors, and instead of making traditional green teas, allowed the leaves to oxidise which turned them a reddy brown colour. They didn’t know what to do, and tried drying them over locally-grown pine wood to stop them from oxidising. One night, as the freshly picked leaves were drying in the factory floor, Imperial Ming soldiers stormed in and slept on the freshly picked tea that was waiting to be processed the next day. When the soldiers had gone, the tea leaves were ruined: trampled on by soldiers tossing and turning in the night, and smelling of their muddied clothes. The leaves had turned a dark brown, almost black colour. Workers wondered what they could do to rescue the leaves. One villager suggested roasting the tea over pine rather than bamboo to hide the smell of the damaged tea, the processing would replace the odors with the scent of pine, and the heat would remove the original damage. And thus by accident, Lapsang Souchong was born.